Oh, stairs, how I love you! The climb up Gothics was pretty relaxed. We followed the trail, taking photo breaks, until we came to the Orebed slide. We clambered through the rubble until we hit the stairs, where we started the long trek up. A few people commented on feeling a little vertigo on the stairs, and on how difficult they were climb – they certainly cause a burn to form in your thighs! But they are much better than handling the slide itself. Not too long after the stairs, at 10:10, we hit an open area, where the junction with the trail to Saddleback meets the trail up Gothics. We took a quick break, spoke with some summit stewards who were hauling rocks up to Saddleback, and then headed up and over to Gothics. The stewards had told us that shortly after the junction we would exit out of the tree line, and hit the open rock faces, and the cables. We were only .6 miles away from the summit, and we were excited. True to form, the trail quickly left the trees behind, and we hit rock face. It was not too far in before we hit the cables. I was expecting metal cables, but these are encased in tubing, which are great for you hands. Additionally, the rock face isn’t exactly that steep – most of the people in our party didn’t use the cables at all. (Apparently, they are much needed when you’re going down.) We quickly scrambled up and over the cables, before hitting more rock face (slightly steeper this time) with no cables. Which is where my fear of heights kicked in. I slowly climbed up, breathing deep and trying not to look behind me. I finally hit the top and quickly got up and moved farther away from the sloping side I had just gotten over. We ended up on a bit of a false summit – wonderful views, but not our destination. We took a quick break to wait for the rest of our party, before pushing on, back into the tree line, and scrambling up more rock faces until we finally hit the summit. There was another group up there, preparing to head out as we arrived. After a bit of a chat, and a promise to see each other on Armstrong, the other group left and we sat down to lunch on the summit. 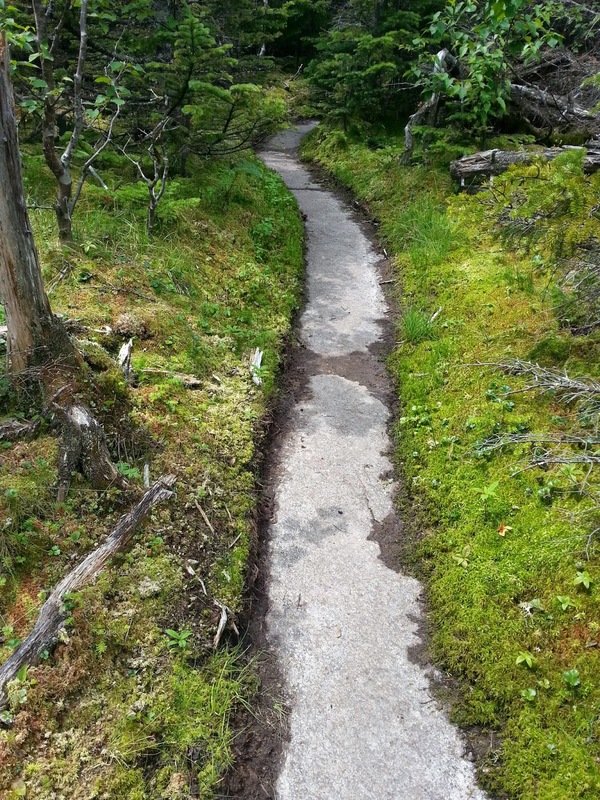 After lunch, we headed back out to Armstrong, following a path of rock cut into the surrounding trees and moss – it really did look like a winding garden path. There is one section, where the path looks like it splits – keep going straight, over rock, and veer to the right, over dirt. 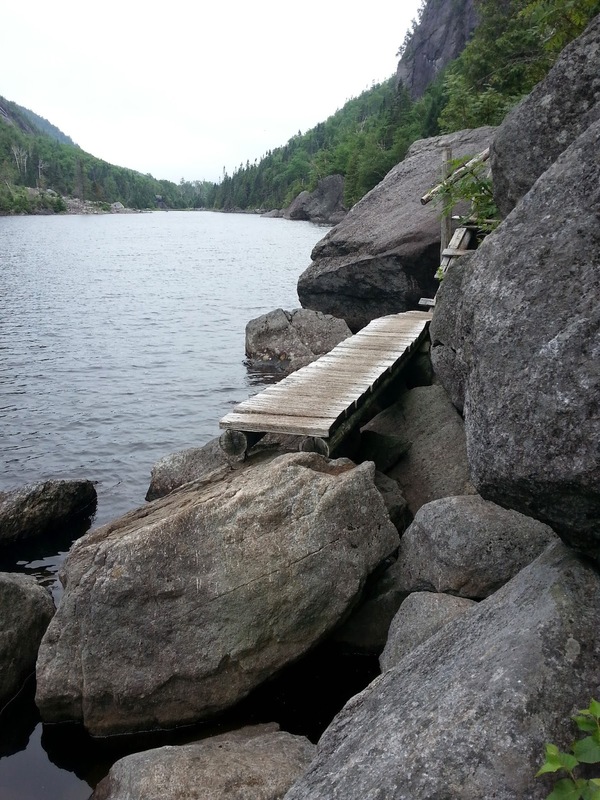 Go right – the straight path takes you over a giant split rock. We hit Armstrong in time to meet up with the other group briefly, along with some other folks that had climbed up in the opposite direction. We didn’t wait too long here, preferring to keep going. 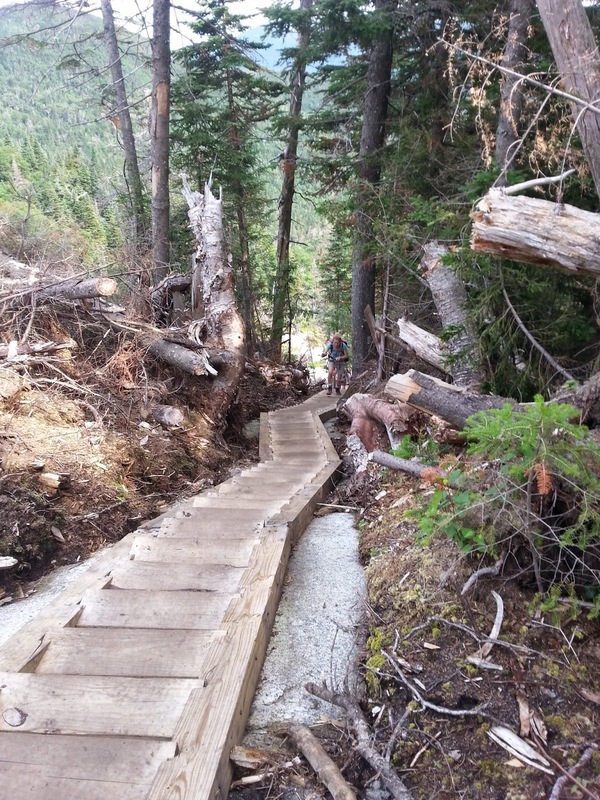 The hike to Upper Wolfjaw was uneventful. We passed the first group, as they were slowing down, and swung up and over many a tree branch and rock, and down one perilous looking ladder. Actually, there was a bit of a traffic jam on the ladder – between several groups coming down, and others going up our pace slowed down. It was a bit of a shocker seeing so many people – Steph and I have been doing some of the less pleasant (i.e. no views from the summit) climbs recently, and usually have the trail either to ourselves, or only sharing with one or two other people. As we approached the height of the trail (and the junction with the trail to the summit of Upper Wolfjaw, which is 20 yards off the trail) we could hear people. And it sounded like a lot of people. A LOT of people. The summit was packed – there was no room for anyone else – it was crowded with a large group of teenagers (teenagers, early 20s, somewhere in there) and their massive backpacks. Steph and I squeezed in for a photo (Steph and I want to compare our summit photos, from last year’s misty day to this year’s sunny day) and quickly took off for JBL. The rest of our group hung out a little longer, before heading off to Lower Wolfjaw. I’m sitting here listening to the rain thunder on the roof, and watching a lake grow in the parking lot out front, so it seems an apt time to write a post about climbing Mount Colden. 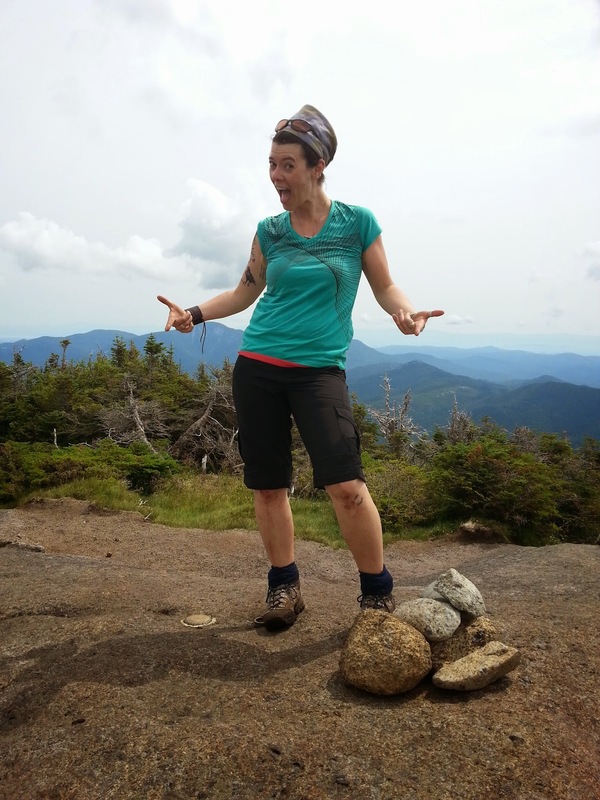 Not that it rained when I climbed Mount Colden, but it was forecast to. I was set to climb Colden the day after my Mount Marshall trip with ADK. On the Sunday, the forecast was for thunderstorms (not good), but the forecast had been changing a lot over the days preceding it, so I thought I’d wait until morning and check the forecast for the day at the Loj. The hike to Marcy Dam was great – I’ve done this hike countless times, but every time I still think “Wait….did the path turn this way here? I don’t remember this little down bit….I though it went left, why are we going right?” until I come to boardwalk area (that’s what I call it, I have no idea what other people call it) and then I feel confident that I’m on the right track. I hit Marcy Dam in about 40 minutes – I must have been really motoring. I had given myself a turn-around time of 12:30 – it rain and/or thundershowers were to start, I did not want to be anywhere near the summit. From Marcy Dam towards Avalanche Lake, the trail continues relatively flat for about 1.1 miles, which is where the junction with the Lake Arnold trail is. At about this point it starts to get a bit rockier – it’s hard to maintain a rhythm as you dodge between rocks, but it still isn’t too steep. 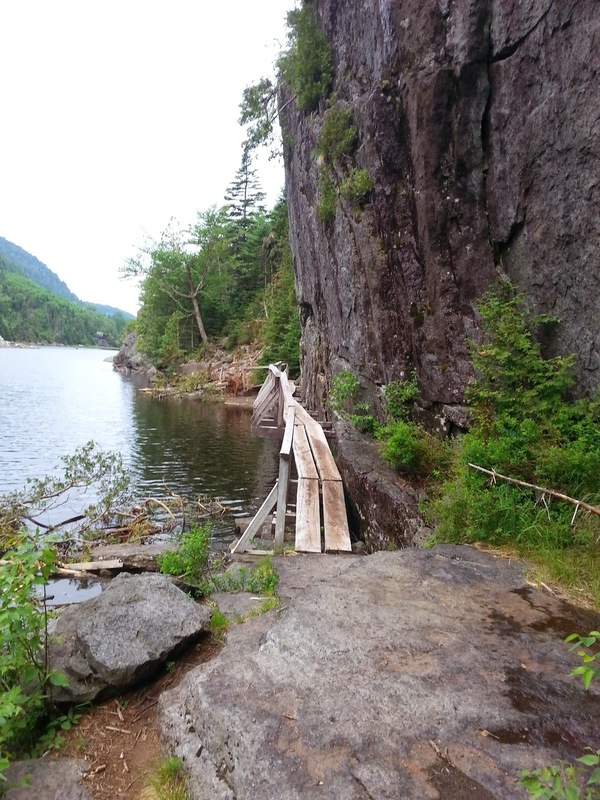 There were also lots of bridges over muckier and/or wetter areas. When I hit Avalanche Lake, I was a little confused. There’s no sign post telling you which way to go, and I couldn’t see any trail markers either. 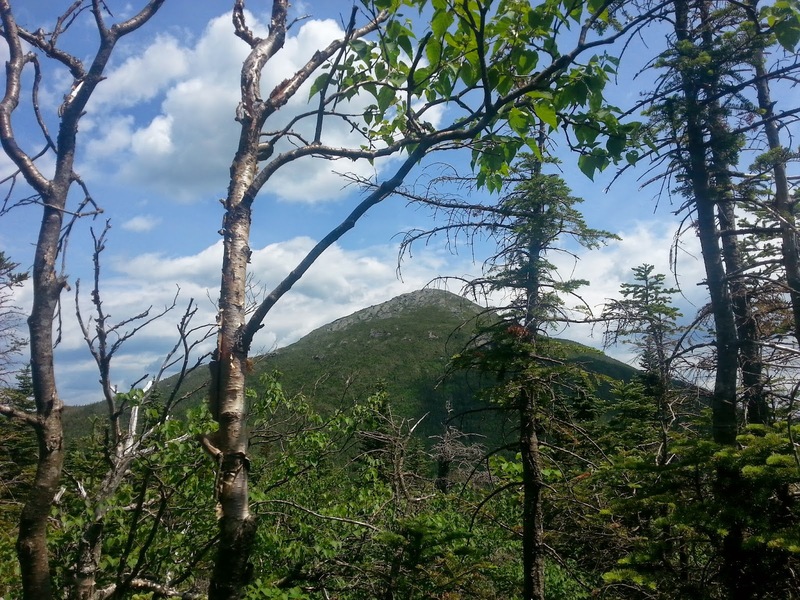 I was also getting a little nervous, as I had only met people heading back to the trailhead (all of them had massive packs, so I assume they had camped at lean-tos), and the summit of Mount Colden (and in fact, most of the peaks) were covered in clouds. You want hitch-up matildas? It’s got 20! 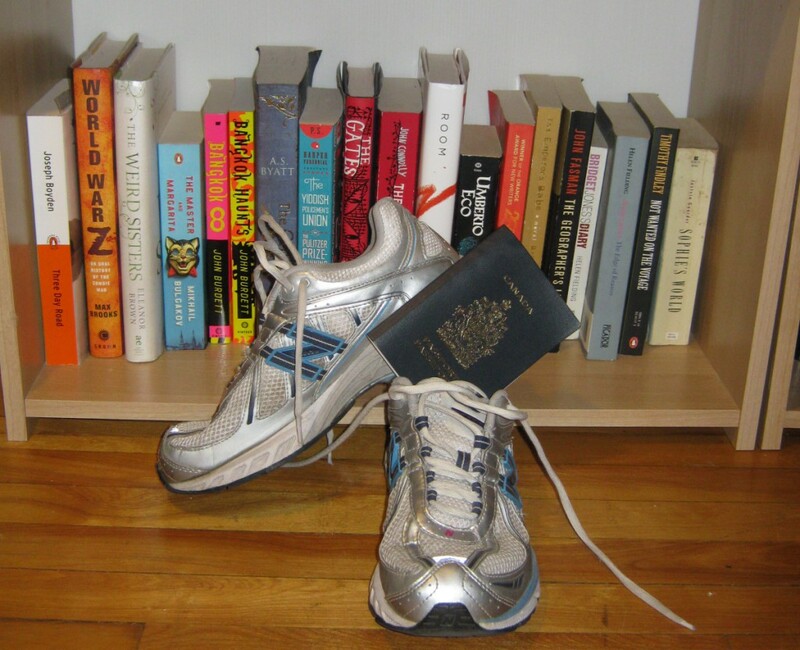 And I’m taking a few liberties there – there aren’t actually 20 hitch-up matildas. It was actually a really fun portion of the hike! There was one moment where I thought I lost the trail – I’d been skirting some blowdown when the trail disappeared……over the blowdown. Once I figured that out, it was smooth sailing again. I came across a broken ladder (*sob* the only time I would have gladly climbed a ladder), and just kept going until…..I was in cloud. I had reached cloud level, and just about then a ladder appeared, leading up a cliff, and then the tree line disappeared, and I was in the alpine zone. I was slightly nervous on the exposed rock in the clouds. I desperately did not want to step off rock – as far as I knew I was the only one on the mountain, given the previous days forecast. I just kept putting one foot in front of the other, watching for yellow paint blazes (follow the yellow paint trail! ), and keeping an eye on the surrounding rock. At 11:21 I finally hit the summit, to some clearing clouds (not enough for a good view), and two other hikers (coincidentally from the same city as me). We chatted a bit, ate some food, and then I was off on the L. Morgran Porter trail, incredibly happy not to be climbing down all those rocks faces. The trail continues over the rock, and down into the treeline, before reaching a col. It then climbs a little, goes over more exposed rock, and then veers sharply right to descend back down into the trees. There are some paint blazes that lead the way, making it hard to lose your way. It’s about 1.4 miles to the junction with the Lake Arnold trail, you’ll one sign points towards Lake Colden, and a little yellow marker with a hand-written “Marcy Dam, 2.6” is just under it. Try getting that out of your head. From the split it’s about 1.5 miles to the end of the trail, where you re-join the trail from the morning, following along Marcy Brook for 1.1 miles to Marcy Dam. And did that trail ever feel nice after the rocky trails down! Just going flat (ish) was a nice change of pace! 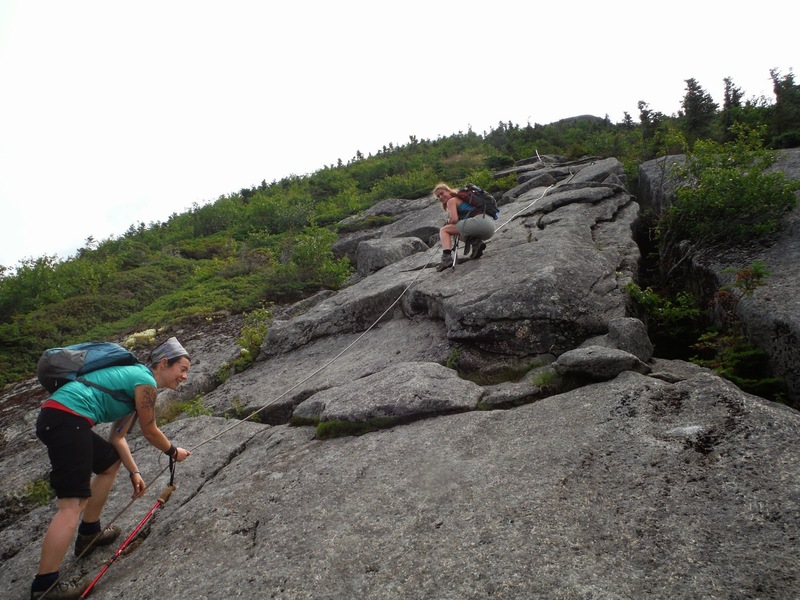 Ever since Steph and I decided to hike the 46 High Peaks, we’ve been hearing horror story after horror story after horror story of hikers not being able to climb Mount Marshall – having to turn around and try again (and again, and again). We were told we would need a map and compass, and more than just a passing knowledge of how to use them both. We were told there were so many false herd paths, that it was easy to lose your way, that it was difficult to get to and would be a long hike. So we put off hiking it, thinking our skills just weren’t there yet. We thought we would hone our skills on other unmarked trails first. But we’re getting to that point where there isn’t much left – it’s time to tackle the legendary Mount Marshall. But of course, as our plans have always shown us, there was a wrinkle. 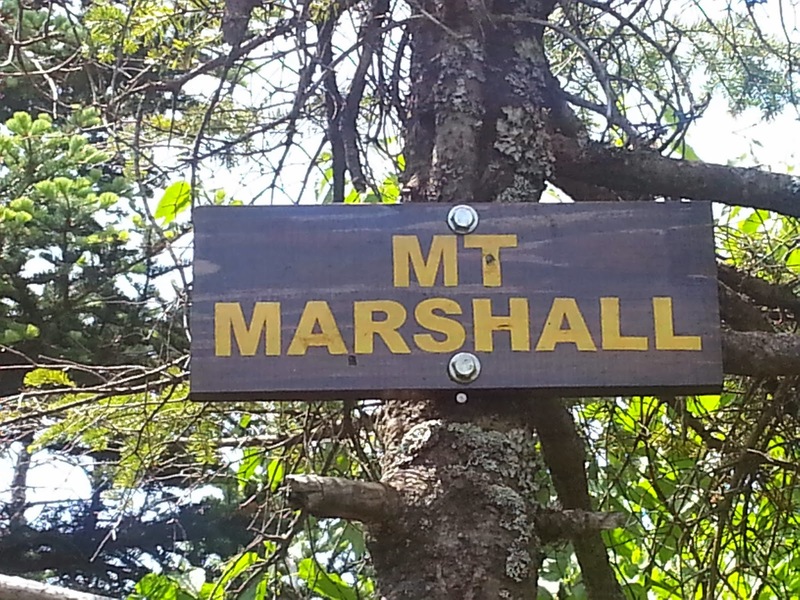 The plan was to climb Mount Marshall in August – have a girl’s weekend camping at Wilderness Campground at Heart Lake, and do the hike then. Then I went and bought a plane ticket to Mongolia for August, which squashed my attempting it in August. 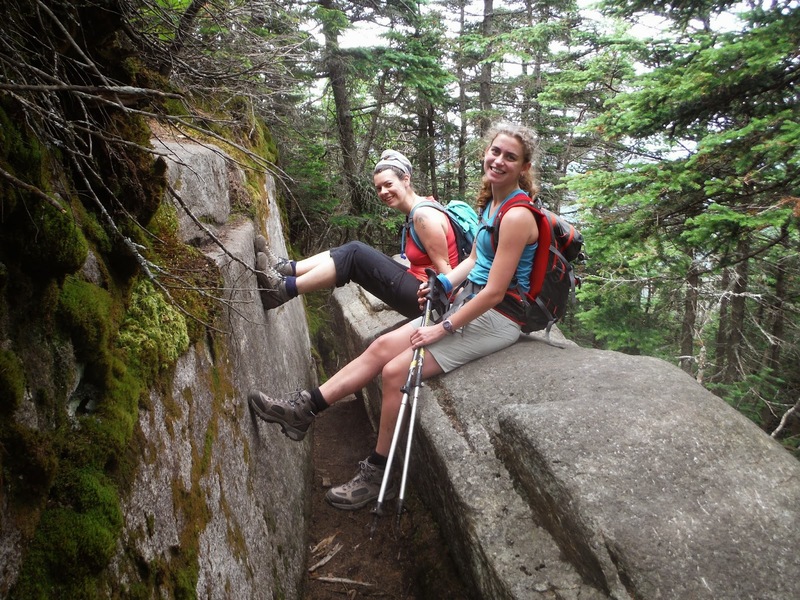 Enter in ADK’s guided day hikes. 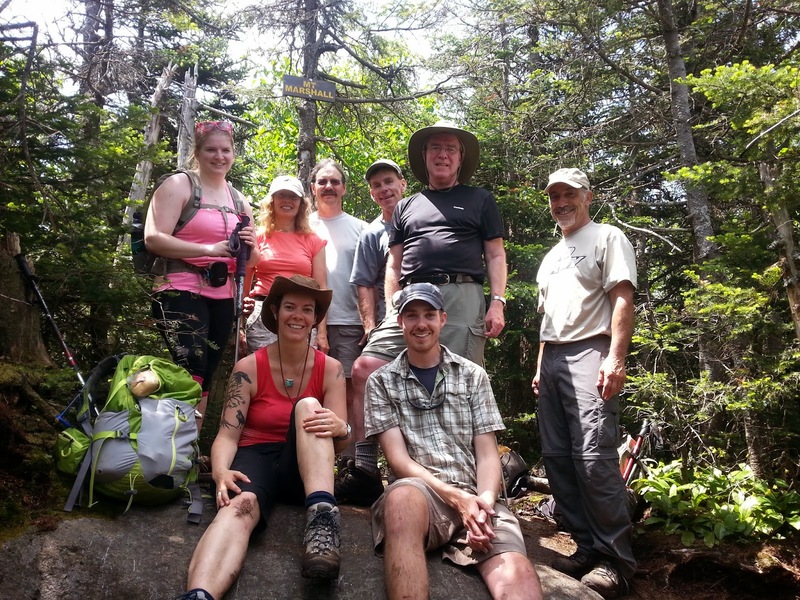 They had a hike up Mount Marshall at the end of June, conviently coinciding with the Canada Day weekend. I signed up, and promised to give Steph an idea of the trail for her attempt in August. First, a note about the guided hike. There were 8 hikers, including myself, on this hike. Besides myself and one other young woman (I’d say in her 20s) the rest were people in the mid-40s to 60s (I’m not good at guessing ages). If you’re a fast hiker, a guided hike might not be the best idea. If you’re a slower hiker, this is a wonderful way to meet people, and gain confidence for longer hikes, or unmarked herd paths. Our guide was great – knowledgable about the area (gave me some great recommendations for GF restaurants in Lake Placid), the vegetation and the birds – he identified several birds by their calls, which I found impressive because I have no clue. 1. If you move a branch, don’t let it whip back and hit the person behind you. 2. Keep your poles under control, don’t whip them back behind you and stab the person behind you. 3. Be patient – everyone has their own pace, and you’re all on this hike together. 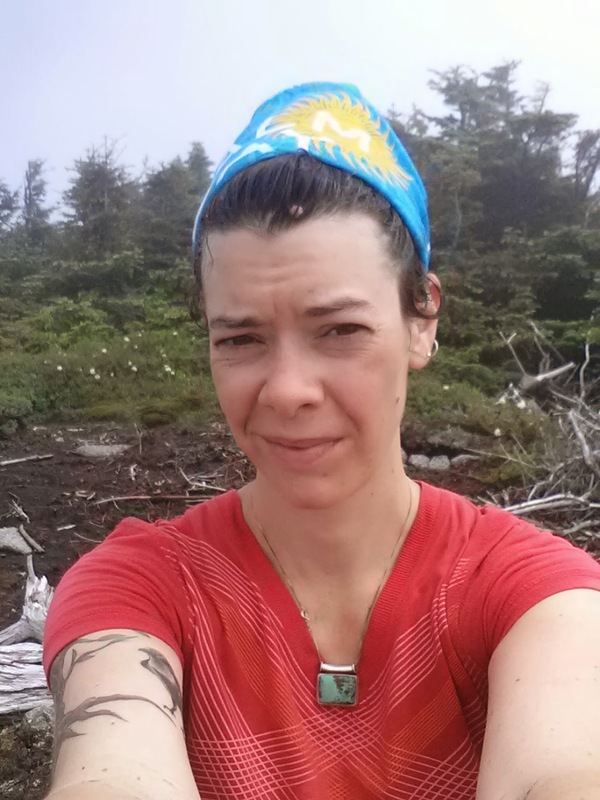 All of the hikers met up at the Adirondack Loj at 7 am, and after a brief round of introductions (“Hi, I’m Anya, from Ottawa. This will be my 32nd High Peak”) and instructions (be respectful and patient, we go at the pace of the slowest person, if you want to leave the group, you can sign a release form) we set off towards the Indian Pass trail, skirting around Heart Lake and signing in at the trail register there. Our guide set a moderately quick pace, but everyone had no trouble keeping up. 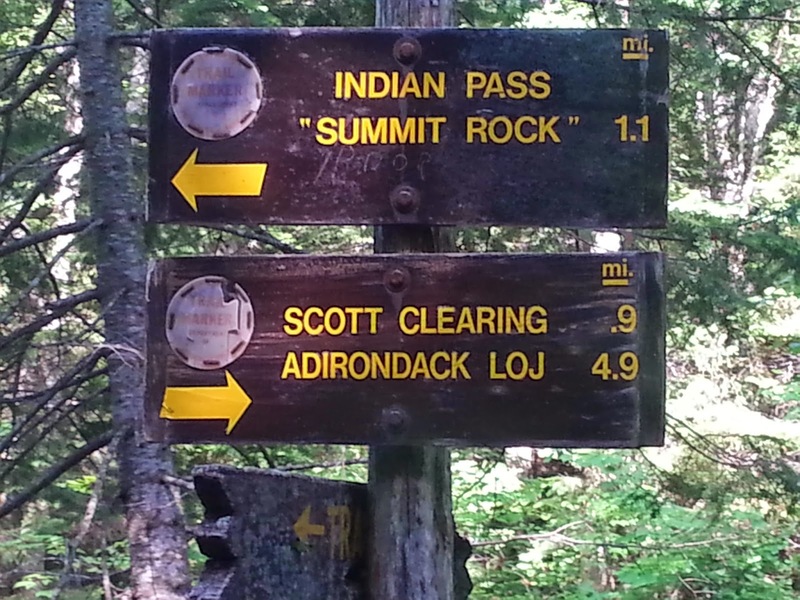 The first 4.9 miles are relatively easy (by Adirondack standards). 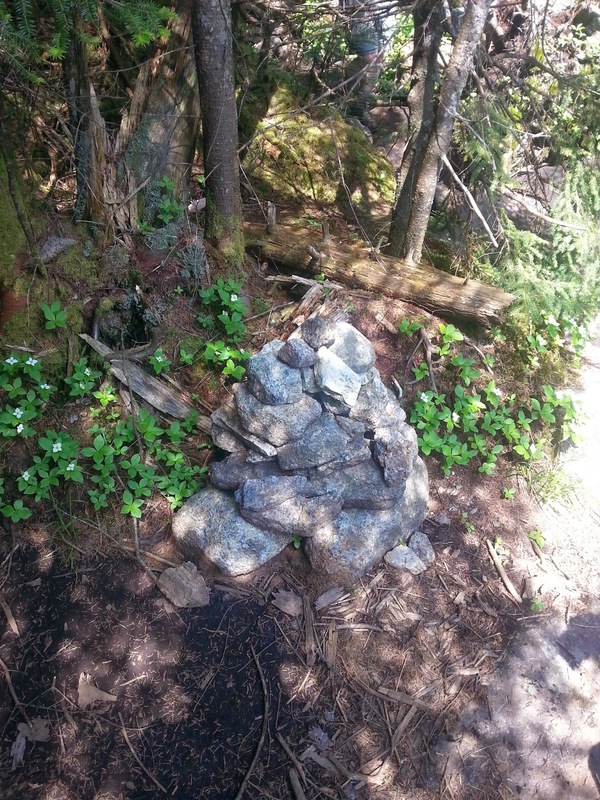 The terrain is flatish, with a few ups and downs, but nothing steep, no large rocks that break up your walking rhythm. Just after passing through Scott Clearing (a large, grassy, meadow-ish area with few trees) we came to a sign post along the river marking the beginning of the Cold Brook Trail. As we followed the trail, we slowed down a bit more, as it got steeper and rougher. Not only did this allow us to “not blow a lung” as one person put it, but to also get to know our fellow hikers. We chatted and joked as we ambled up to the height of the trail (around 1.7 miles), which is where the cairn marking the herd path up Marshall is. This is where the trail became steep. 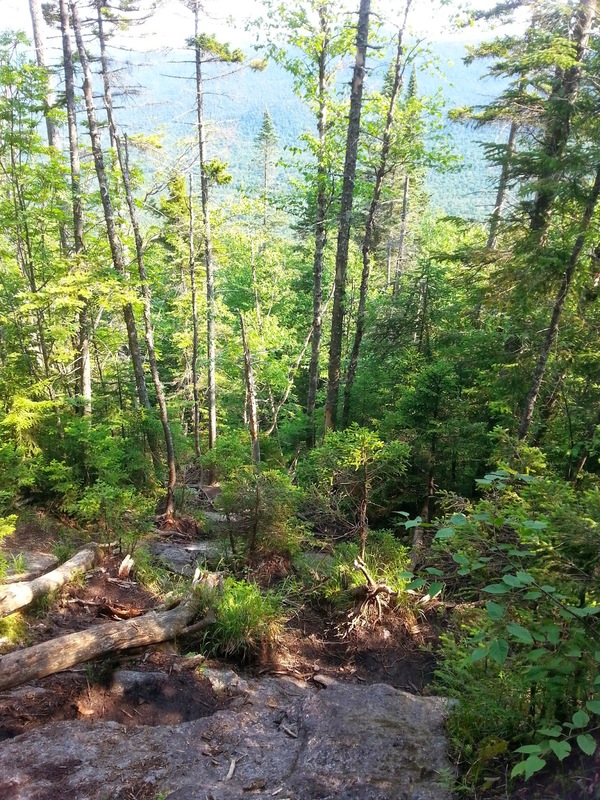 Even then, it felt like an ordinary-Adirondack-level of steepness – there were rocks to avoid, rocks to step on, rocks to scramble over, but it wasn’t the steep scramble that you find on Saddleback, Colvin or South Dix. This was your regular scramble over a giant boulder. We took it easy here, as we adjusted to the new terrain. More rocks, more scrambles, more dodges around trees. And not once did we lose the trail. I’m not sure how we could – this herd path was well defined. 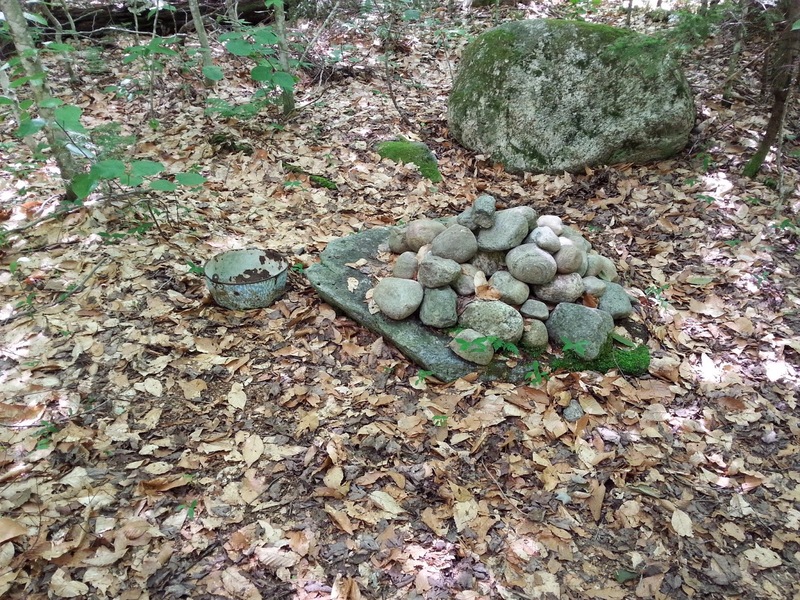 Near the beginning of the trail, one of the members of the group decided to bow out. His legs were cramping up, and he didn’t want to risk our not making the summit. I’m sure this was a rough decision for him, I know I felt bad that he couldn’t continue with us. Our guide asked him to wait for us at the cairn, to be sure that he wouldn’t get lost on the way out, and to be sure that his leg cramps didn’t become worse as he descended. At this point, we were not very far from the summit – I would guess maybe another 30 or 40 minutes would see us there. We promised to be quick, and continued up the herdpath. As we climbed, we could see Iroquois (“Ear-o-kwah” in Canadian, “Ear-o-kway” in American, apparently) across from us. Cold Brook actually passes between the two mountains. 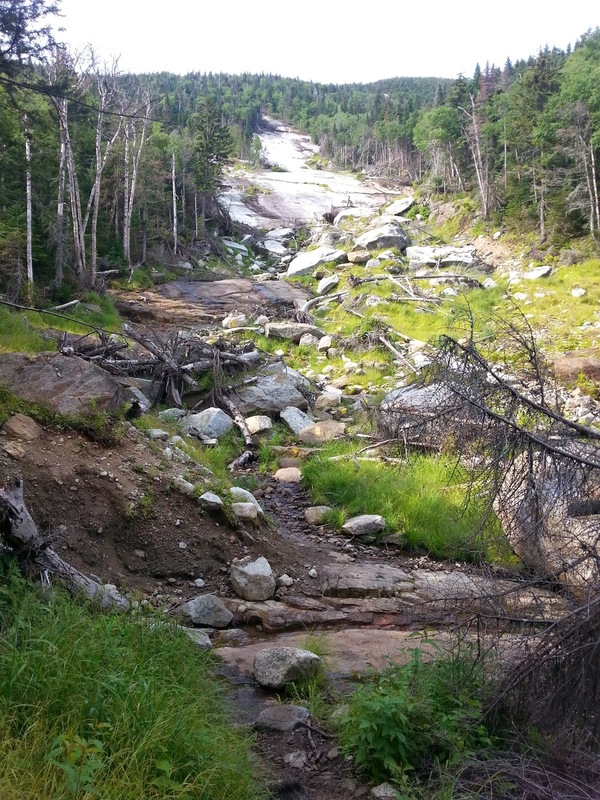 Just as with the Cold Brook trail, this herd path up Marshall was free of blowdown, but lots of overgrowth. It’s worse on the way back – the branches are much more “grabby” in the other direction. It was also incredibly muddy when we went through – our guide nearly lost a shoe when he stepped into what we all thought was just a bit of mud. Sank nearly up to his knee. After being on this path for a little bit, you come out to an open view, and see a peak way off in the distance. This is Marshall, but it’s the Nippletop Syndrome – it looks forever away, but it’s really less than a mile. The path dips down, then starts climbing again. Eventually the path came to a sort of T-junction. You can go left (down) or right (up). Left takes you down Marshall, along the Herbert Brook trail, right takes you up to the summit. Immediately after this junction, the trail splits again. You go right again and shortly after come to a large boulder on the side of the path, with a summit sign on top. 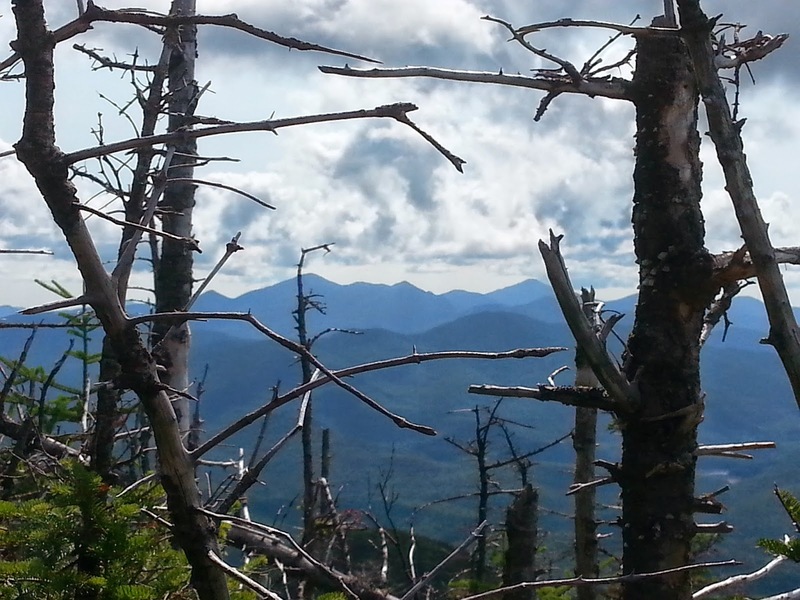 I’m glad that I signed up for an ADK guided day-hike. It was lots of fun, it was great meeting other hikers, and I didn’t have to worry about whether or not I was on the right trail. But I do feel that hikers that I talked to when I was first starting out were lying to me. Mount Marshall, while being a long hike (~17 miles) is certainly not as fear-inducing as they had led me to believe. The trail was easy to follow, there were no signs of other, misleading herd paths, at least not on the route that we took.